When finished with, the garden kneeler seat easily folds flat for compact and convenient storage. 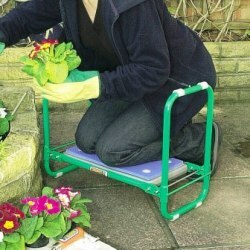 The Draper garden kneeler has a sturdy tubular iron frame with folding legs / hand rails. The garden kneeler seat has a double-sided pad which acts as a seat (plastic) or a kneeler pad (foam). This garden kneeler seat has a maximum carrying weight of 125kg (19.5 stone). The Draper garden kneeler seat has dimensions of 54cm x 25cm x 40cm. This garden kneeler seat is a great quality product. There are cheaper kneeler products on the market - but you get the quality you pay for. When it comes to your knees and back, looking after them should be priceless!